A five star hotel but felt much more , have never felt so relaxed as the two weeks I stopped there , all the staff are so helpful and cant do enough for you . There are few suites that are placed side by side two at a time but are not overlooked and each have a small swimming pool so if you just want to chill on your own or with your partner without being disturbed by others you can do . There are two restaurants , one situated by the main pool area the other above the kitchens , you do have to book for the one above kitchens so if you are there for a special occasion or just want to spoil yourself book a night in that restaurant with views out to see . The beach is a very short walk away and Acharavi town is only a ten minutes pleasant walk away either by road or a little longer along the beach . The Hotel Afitis a four star hotel , what can I say about this hotel ......Well we enjoyed this hotel so much we stopped here two years in a row , The hotel itself it situated just out of the small town of Afitos right on the beach front , it also has some studios just 600m from the hotel these are very pleasant and are a good size . Afitos town is five minute walk up some steps behind the hotel and is well worth a walk round but is a very small town for more shops and places to eat Kallithea is a twenty minute walk along the back road and is a very pleasant walk even at night , there are loads of bars and taverna's there and does get lively at night so if thats not your thing then stay in Afitos for food . A Family run hotel that can guarantee you a very warm welcome , these studios in Thassos are were you will be made to feel like an individual rather than just a number . The studios are located right on the beach front so no walking miles to dip your feet in the perfect blue sea . TV ,phone , hair dryer , kettle , fridge electric hob and even a baby cot if needed . 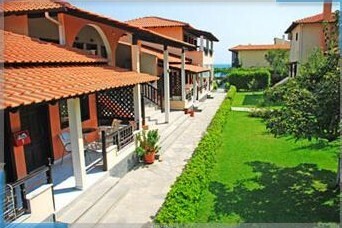 each room has own balcony or veranda with views of the sea or mountains . The dolphin hotel St Georgio Antiparos featuring its Aegean architectural style yet has all the modern facilities you could wish for . The hotel itself is located in the traditional village of St Georgio of Antiparos just under 7 miles from the town of Antiparos opposite the Despotiko island . Daphne holiday club , just tucked away from the main road and away from Hanioti main town yet still only a brisk five minuets walk to the beach . When we stopped here we went self catering and the room had a great little kitchen , very basic but what more do you need . 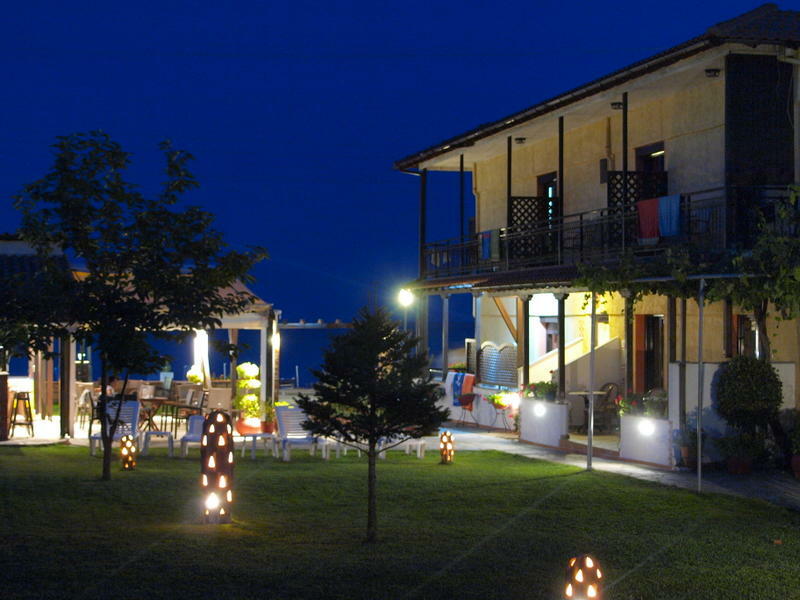 There is a nice sized swimming pool (photo left) that is situated on the roof with a lovely restaurant and pool side bar where on a friday night they hold a great Greek night consisting of Greek music and a bbq . Over all a very pleasant small holiday resort with terrific views of woodland at the back of resort beaches close by, friendly staff . With Backdrops of the pine forest valleys and mountain scenery this small family run hotel is perfect for that quite get away , a warm welcome awaits you as soon as you arrive . This is a hotel you will return to time and time again . The hotel itself only has 14 rooms so you will never feel crowded and the rooms are finished to a fantastic standard with air conditioning , tv , fridge and much more . 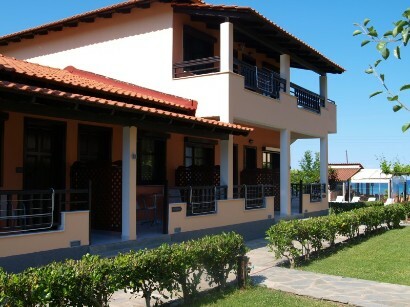 Overall if you want a relaxing holiday away from it all then hotel Kamelia is the place for you . The hotel itself has a swimming pool , a fitness centre & even a small cinema room . There are two small beaches just a small stroll across the road . 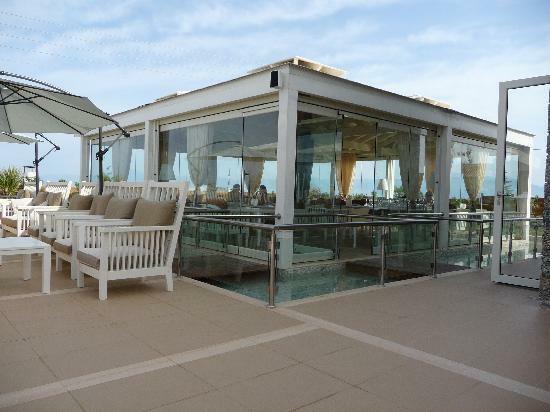 Although Porto Skala is a small hotel it offers an all inclusive package that you wont be disappointed in with breakfast & dinner being different choices every night and pool side snacks from the bar for lunch that even the biggest appetite will be happy with .